Sunspot group 1045, seen here Feb. 7, 2010, is an active region that has produced moderate (M-class) solar flares. Forecasters say it could unleash a large (X-class) flare. A new group of spots is traversing the face of the sun. Sunspot group 1045 is an active region that has produced moderate (M-class) solar flares. 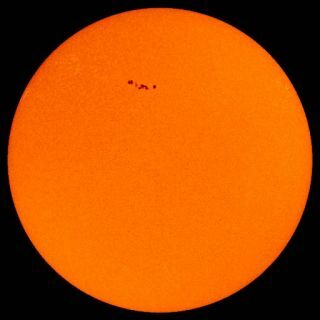 The spots could unleash a major (X-class) flare, though that probability is low, according to the U.S. Space Weather Prediction Center. Sunspots are areas of intense magnetic activity, cooler than the surrounding solar surface. They act like caps on a soda bottle, and when things are shaken up sufficiently, the caps blow and a flare of radiation is released, often along with a cloud of charged particles called a coronal mass ejection. Such space weather can pound Earth's protective magnetic field, with the most severe X-class storms crippling satellites and having the potential to knock out power grids on Earth. Each of the new spot in the group is about twice the diameter of Earth, according to Spaceweather.com. Experienced backyard astronomers with properly outfitted telescopes can easily see the spots. However, looking at the sun through a telescope without a proper safety lens can permanently damage your eyes. The sun has been relatively quiet the past two years. It's at the low point in a known 11-year cycle of activity. The next peak of activity is expected sometime in 2013. The ability to predict how strong the next peak will be, or when any given storm will strike as activity ramps up in the coming months, remains iffy. NASA plans to launch the Solar Dynamics Observatory (SDO) this week to study the sun in greater detail than ever before. Continuous high-definition observation of the sun's coronal atmosphere will help scientists can track changing patterns in the corona that could indicate imminent flares.